TORONTO, Jan 18 2012 (IPS) - The image of United Nations peacekeeping operations has become seriously tarnished in recent years, say some independent experts who monitor the U.N. missions around the world. The latest example is the persistent report that its soldiers introduced a deadly cholera epidemic to a ravaged Haiti following the 2010 earthquake. Peacekeepers there have also been accused of sexually assaulting a young Haitian man in an incident which was recorded on a cellphone video. Taking a close look in a new book at the 100,000 or more soldiers serving under U.N. auspices, a past advisor to the United Nations, Walter Dorn, says there is substantial room for improvement. He concedes that the high-profile United Nations military missions in both Haiti and the Democratic Republic of Congo represent “mixed successes”. Haitian Cholera Victims Seek Reparations from U.N.
Dorn intends with his new book to make U.N. peacekeeping operations “more effective”, in terms of offering security for civilian populations facing warring factions or humanitarian disasters in a country like the Congo. For instance, the modestly sized U.N. force of 22,000 uniformed personnel in the DRC “has been a very important stabilising force”, Dorn says. But he adds the U.N. soldiers’ failure to a stop a 2008 massacre of at least 150 civilians in the eastern Congo village of Kiwanja despite the presence of peacekeepers a kilometre away stems from a still existing failure by the contributors of United Nations soldiers to take full advantage of affordable surveillance and communication technology for ground operations. “In many of the developing countries where the majority of peacekeepers are today, they don’t have a familiarity with the technology,” Dorn adds. A Canadian military historian at the Royal Military College in Canada in the city of Kingston, Ontario, counters that U.N. military missions are really counterinsurgency operations. “In the Congo, the U.N. is not exactly neutral, going after militias on behalf of the government,” says Sean Maloney, a professor at the Royal Military College in Kingston Ontario. Maloney told IPS the impartial style of peacekeeping as represented by Canadians serving as U.N. soldiers and keeping armed Greek and Turkish-speaking people at bay in Cyprus in the 1970s was rendered “obsolete” starting in the 1990s. “We are going to see more interventions. They will be more coercion- style interventions (like the NATO mission in Afghanistan where Canada had upwards of 3,000 soldiers) that will be siding with one side or another,” adds Maloney, describing himself as pro-military and “libertarian”. Laura Seay, an assistant professor of politics at Morehouse College in the U.S. and an expert on the DRC, says a tiny U.N. mission faces an “impossible” task by operating in a country like the Congo that is the size of Western Europe but minus sufficient resources to do its job. “They are too spread out. If there was a problem in one area, they would have to leave civilians behind vulnerable to attack,” she told IPS. Among the litany of complaints is that the U.N. peacekeepers in the DRC who tend to come from various south Asian countries are ill- trained, ill-equipped, cannot communicate in the common language of Swahili and do not interact with the local population. Seay confirms that the U.N.’s support of the central government in the capital Kinshasa has a downside. “The Congolese army is a source of human rights violations. If you are supporting the army and its activities, you have a perverse affect on civilian protection,” she said. Nevertheless, the U.N. has created “a semblance of normal life” in the strife-ridden eastern Congo and made commercial activity possible, which in turn has made the peacekeepers popular, she added. However, the U.N.’s stabilisation mission in Haiti is quite overbearing, reports Courtney Frantz, the author of a recent report for the Council of Hemispheric Affairs in Washington. “They have become an instrument of the U.S., France and Canada in terms of their economic interests (including privatisation in Haiti),” he said. 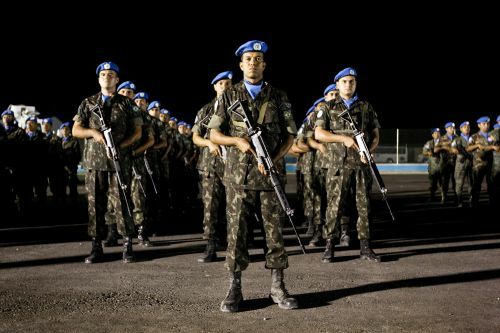 A little under 10,000 U.N. “blue helmets” were dispatched to Haiti in 2004 following the overthrow of the democratically elected president Jean-Bertrand Aristide under chapter VII of the U.N. Charter, where the Security Council has determined that the situation “constitutes a threat or breach of the peace”. “There is no international threat; there is no war going on in Haiti, as there was in Iraq, Afghanistan or the Congo,” Frantz, a research associate at the COHA told IPS. The party of the former president, Aristide, the Lavelas Party, was not permitted to participate in the recent Haitian election. Finally, Frantz adds, the U.N. peacekeeping mission has not played a significant role in alleviating the damage caused by the earthquake in early 2010. “The U.N. has done very little humanitarian assistance that they said they were going to do. More on preventing looting,” he said. Walter Dorn maintains that the U.N. has delivered “law and order” in Haiti following the high-profile 2006 raid of Cite Soleil in Port-au- Prince, the capital. But Courtney Frantz counters that the U.N. has ignored extrajudicial killings in Haiti and “perpetrated acts of violence” against local people in Cite Soleil. Not everybody is convinced that pure peacekeeping is passé. “The idea of Canada being a peacekeeping nation is not a bad thing for Canadians to identify with,” journalist Jamie Swift, co-author of the upcoming book, “Warrior Nation: Rebranding Canada in an Age of Anxiety,” told IPS.